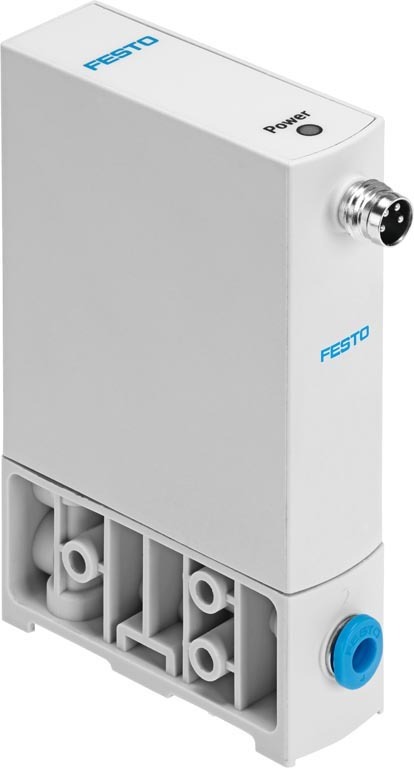 With their many advantages, digitally controlled, high-precision piezo valves like Festo Canada’s new VEAA and VEAB make a strong case to replace conventional solenoid valves in a wide range of industrial applications involving flow and pressure control. Piezo valves use very little energy, generating virtually no heat, which helps qualify them as intrinsically safe for use in volatile or explosive environments. VEAA and VEAB valves combine piezo technology with digital closed loop control for highly precise, consistent, silent operation. Their piezo component – the piezo bender – is virtually immune to mechanical wear and doesn’t abrade, enabling these 3-way proportional valves to last through a very high number of switching cycles (over 300 million) or set point changes. Compared to pressure regulators using on/off valve technology, these new valves from Festo offer precise regulation with high repeat accuracy according to a preset value without fluctuations in the output pressure – even with varying air consumption. And both valve types can regulate very small volumes reliably, as well as vacuum and overpressure. Both VEAA and VEAB valves are IP65 rated. VEAA is designed to proportionally control pressures up to 10 bar with a flow of 7 litres/minute. The VEAB can proportionally control pressures up to 6 bar with a higher flow rate up to 20 litres/minute. Both valve types are easy to install. Control parameters can be selected from the values stored in the electronics to cover almost all applications, making them basically plug and play. They are particular well-suited for applications with low to micro air consumption such as small cylinders, grippers and rotary actuators, as well as for applications requiring highly dynamic response characteristics. Examples include pressure over liquid, controlling contact pressure cylinders, or low-pressure regulation for wafer production. In addition to pressure regulation, they can perform checking, metering, pressing and press-fitting functions in a range of fields.